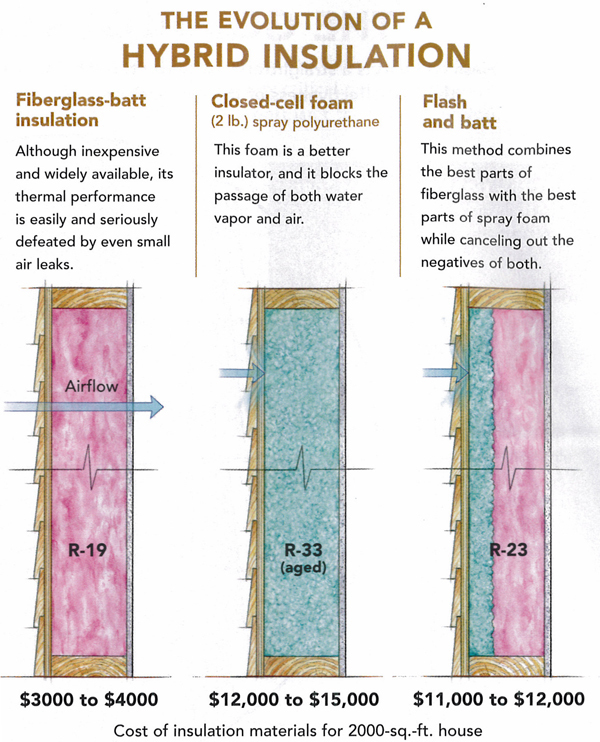 Closed cell spray polyurethane foam may be the best performing insulation available today. It seals against air infiltration, it boasts more R-value per inch than other forms of insulation, and it blocks the passage of water vapor. It’s also the most expensive option, and it requires dedicated equipment for large scale installations. 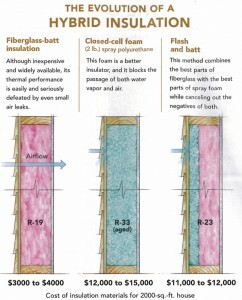 Fiberglass batts, on the other hand, are by far the most commonly installed form of insulation. Batts are widely available, are easy to install, and insulate fairly well provided no air moves through them. The problem is that most homes, new and old, have a lot of air moving through their walls and roofs. Like a knit sweater on a windy day, fiberglass batts do nothing to stop air movement. Even when there are no air leaks, a great enough difference in temperature between indoors and out creates convection loops, currents of air ferrying Btu from warm drywall to cold sheathing. Fiberglass batts are cheap, though, making them a tempting choice. What if you could balance the performance of spray foam with the cost effectiveness of fiberglass batts? Enter flash and batt. This hybrid system relies on a thin flash coat of foam sprayed against the inside of the sheath­ing, with the remainder of the framing cavity filled with fiberglass. Flash and batt costs as much as $2 per sq. ft. less than meeting R-value requirements with foam alone. Like any element of building, however, there’s more to a successful flash­ and batt installation than many people realize. If the ratio of fiberglass to foam isn’t carefully considered, the performance and financial benefits of this hybrid approach will be diminished quickly.